It is assumed this process will be applied by a network administrator. caWeb4 must be installed and setup to run correctly in a standard Microsoft Windows Server based environment. IIS 6.0 will also be required. 1. 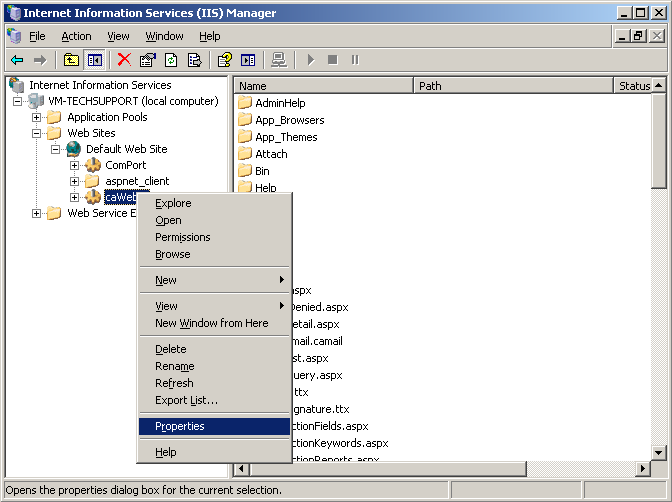 Open Internet Information Services (IIS) Manager and right click on the caWeb4 virtual directory as shown below. 2. 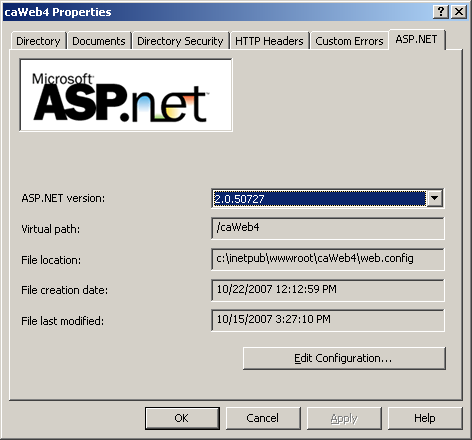 Click on the “Properties” option, and choose to the ASP.NET tab in the Properties window that opens. 3. Click the button labeled “Edit Configuration” to open the Configuration Settings window. 4. Go to the “State Management” tab and change the “Session timeout (minutes):” to your desired value. 5. Click the “Apply” button. Click the “OK” button to return to the main IIS Manager window. Changing the timeout value will end all active caWeb sessions, logging out any users who are currently logged in. Users will lose any unsaved changes to records.